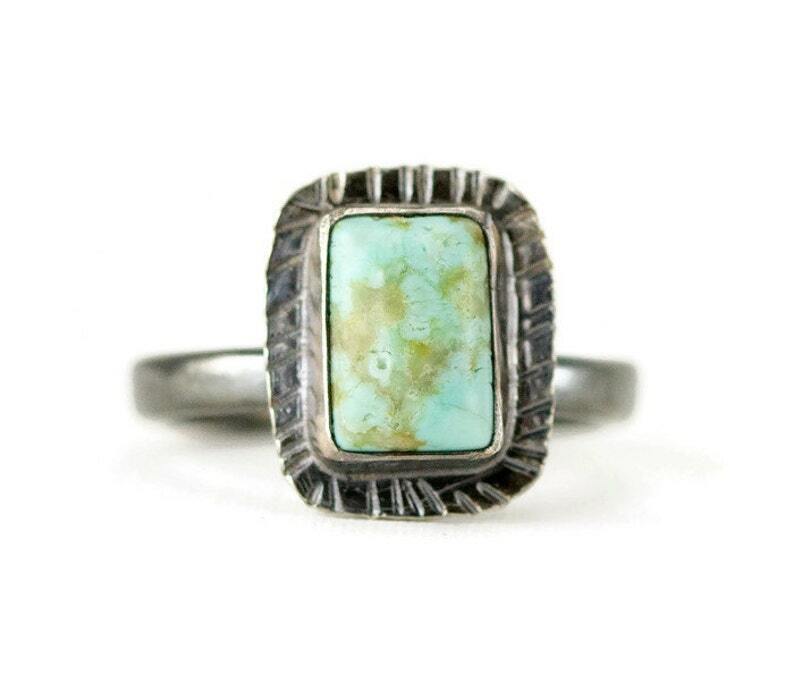 Unique small emerald cut turquoise stack ring has a great southwest look with a bohemian feel. A simple hand stamped boho sterling ring with a lot of style that is fun to wear. Simple silver jewelry just never goes out of style! The turquoise is a small backed Arizona genuine turquoise, rectangular in shape 9 x 6.5 mm (about 5/8 inch long and 1/2 in wide in the setting) surrounded with a hand stamped surround. The color is a beautiful blue with tiny amounts of micro matrix. Ring is a size 8 and ready to ship! Ring band is hammered sterling, 2.6 mm wide and 2 mm thick, and very sturdy. I am able to size this ring up about 1/4 - 1/2 size. This turquoise is from a mixed lot of minis that did not specify mines, only Arizona turquoise. A great stocking stuffer or Decembr birthstone gift for her! Each of my rings comes in a ring box suitable for gift giving. Included with your ring is a draw string pouch for storage.